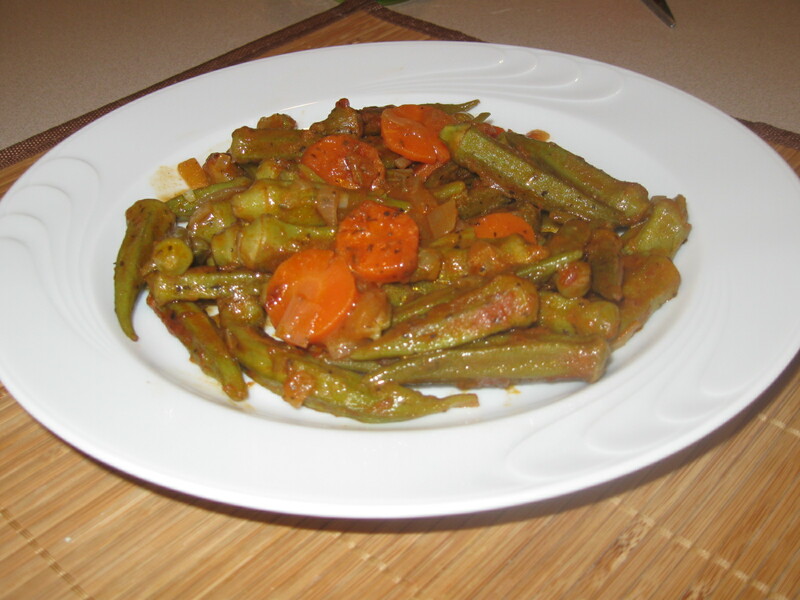 Here’s another nice and healthy vegetarian dish to try. On the tastometer, okra is like Brussels sprouts. It’s love or hate and not much in between. I fall on the love end with okra. I varied this traditional Greek recipe (from the `ladera’ family of recipes) adding dried mint. It was a small experiment and it came out good. I really liked the mild freshness the mint gave to the dish. How to make: Heat the oil in a deep pan and saute the onions and carrots. Add tomato sauce and keep cooking for about 10 minutes or less (more if the carrots are not thinly sliced). Add the okra, stirring very softly just once to cover them somewhat with the sauce. Let them saute for about 5 minutes with the sauce. Add salt, pepper and mint (generously but don’t over do it, check the taste). Add water to barely cover the okra. Cover the pan and cook for about 20-25 minutes or until okra is tender. Add water as needed. You can leave as much or as little water as you like. In my family, we don’t like it watery as you can see in the photo. Notes and tips: Follow the recipe as instructed and it will come out great. At least with the frozen okra, you don’t need to add vinegar to the okra ahead of time and let it stand or any other trick you might know to make sure it will stay put when cooked. All I ask you to do is to not stir and mix the okra while it’s cooking. You can stir the food by shaking the covered pan but do not use spoons. That’s all. The okra will stay nice and sturdy. I promise.